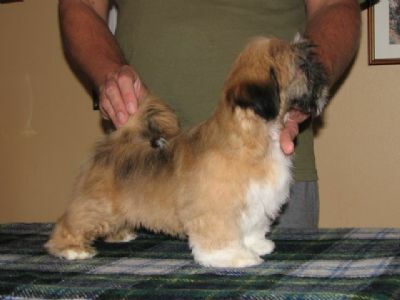 Humphrey is the first Lhasa Apso imported into Australia from the world renown Chic Choix Kennels in Finland. Humphrey arrived late January 2009, experiencing some of the hottest days on record whilst in quarantine, he lost most of his beautiful coat, 12 months later he is looking magnificent. 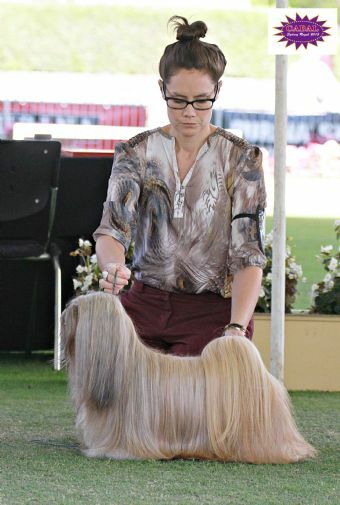 Humphrey is now an Australian Champion, he finished with a Best Of Breed and Intermediate in Show at The Non Sporting Dog Club Of NSW show on 12th September, 2010 under Judge Ms. L Woolley of Victoria. Humphrey goes BISS under well respected Breed Specialist Arnold Townson October 2010. Mr. Arnold Townson (Asahyl Lhasa Apsos): A very impressive gold not exaggerated in any way. Beautiful head, almond shaped eyes frontally placed giving great expression. Strong neck into good shoulders, straight front legs, strong body, short loin and strong topline. In beautiful coat of excellent texture. Moved with reach and drive.